And then the Loeries were but a memory. Remember my blog post about last year’s experience? This year was same same but different, as I didn’t jet along to Durban with the rest of the team but was glued to my laptop in Cape Town for five days straight sorting out all sorts of admin, last-minute changes and uploading of content. Husband was up in JHB for much of that time to attend his Gramps’ funeral so t’was an odd, stressful time all round but we survived. Hills was kind enough to send the doggies samples of their new Special Stews – a tin each. Bassie got the version for mature doggies 7+ while Bertie tried the ‘1- to 6-year-olds’ can. Both gulped them down then sniffed each other’s bowls (both had been the same flavour). That’s me in the chef hat that accompanied the delivery. Click here for more info. I can just remember this breakfast if I stretch my memory back two weeks. Husband had an open omelette he could barely finish it was so stuffed with things, and I went for the waffle with syrup and ice cream, as you do on a Saturday morning. There was a chilly breeze blowing so Husband covered up after we’d eaten, for a very brief stroll along the beach and back to the car, which we’d parked near the lighthouse on Woodbridge Island. Later that evening we went off to braai with friends who have moved into a new house that included this gas oven and a wonderful shelf full of Batman and Superman coffee mugs. We also met their new doggie, the Brindle Boxer you see me chatting to. His name is Zeplin, and at just a few months old is already bigger than Bassie and Bertie combined! 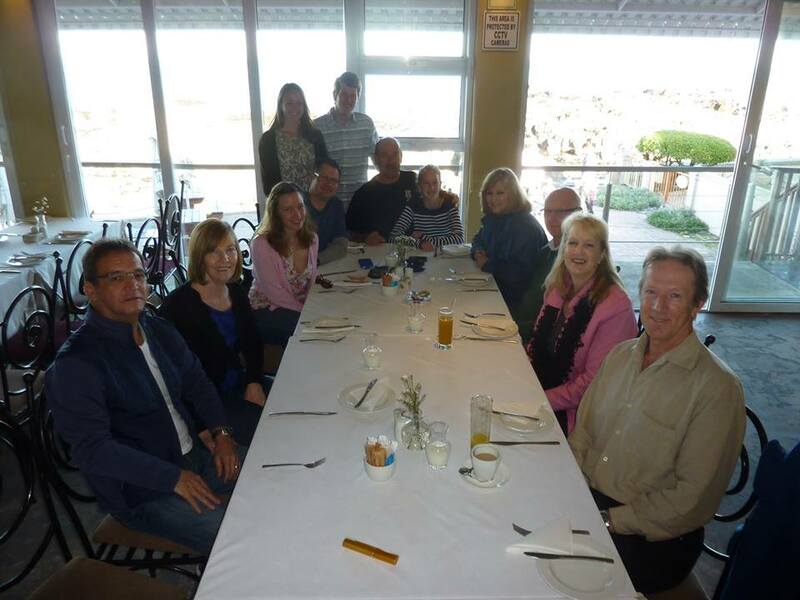 It was time for the annual family birthday breakfast get-together, this time at News Cafe in Blouberg. Most of us opted for the early bird special, and look at the precious piggy/panda foam art in my cappuccino! Click here to see the 2013 version of this photo. Husband was kind enough to accompany me to the launch of Business Day’s Wanted Online website after work, where we marvelled at some of the art on the walls and the amazing fresh snacks on offer. Look at the size of those strawberries I drizzled with chocolate. Husband had lots of greens. Bertie knew something was up when his dad hauled the suitcase out the cupboard to pack for his brief trip. More so when his dad hopped into an Uber and set off without us. That strip of light on the right is his collar glowing in the dark as he watched dad get into Uber pre-dawn. Once safely checked in at the airport, Husband had breakfast at Primi with a view over the runway. He took a pic of the wing out his window once on the plane, too. He loves flying. After a franticaly busy day at work (home) it was time to pack up laptop, doggies and self and set up camp at the parents’ house. The second we got there Bassie and Bertie set about exploring the garden (though it’s hardly new to them as they visit each week). Top is little Miss Bass sniffing the grass cautiously, bottom is Bertie running along the paving all around the house. Husband snapped this lovely shot out the window on his way in to land in Cape Town where he belongs on Saturday morning. No more pics of the day as it was a blur of work, alas. Husband had enjoyed his breakfast with his parents at Doppio Zero in JHB so much that he tracked down the only Doppio Zero in Cape Town and decided that’s where we’d breakfast on Sunday. Such tropical blooms were on display in the reception area of the Mandela Rhodes Place Hotel in St George’s Mall, in which Doppio Zero is based. Trees of light guided the way to Doppio Zero. So breakfast we did. That’s my cappuccino, and his breakfast Cola. What did we eat, you ask? I went for the Nutella French Toast, Husband had the Barbarossa, which is hash potatoes, beans, eggs, chorizo, haloumi, spinach, chili, feta and salsa. Just look at Bertie with his new TV-watching companion, Bear (Dinosaur has since been flattened and thrown away). He couldn’t keep his eyes open on Monday night when I attended the first online lecture of the Social Media Marketing course I’ve just begun. I barely kept eyelids open myself. I’d no sooner caught my breath from sending out our Loeries overview newsletter on Monday than it was time to cover the Business of Design conference at the Inner City Ideas Cartel, one of my favourites. Look at the yummy pre-conference snacks we got to choose from! It’s not all about the food at conferences, but that’s what I usually end up taking pics of 🙂 That’s a custardy pastry on top, the lovely stitched goodie bags we received in the middle, and a tiny jar of salad I sampled at lunchtime, on the rooftop. I worked too, promise. End of Loeries 2016 meant it was time to celebrate at work. We can’t go for a team lunch without taking a few photos. 🙂 These make me smile. We decided on Jerry’s in Observatory, and all had amazing burgers. See? Amazing. You can’t go wrong ordering the ‘Jerry’ at Jerry’s. It’s a patty with Swiss cheese, BBQ sauce and caramelised onions. And of course you douse all your chips with Sriracha sauce, like so. Observatory is a hive of activity on your average weekday afternoon. WJust look at this green vehicle drawing lots of attention while parked outside the Obz Cafe. 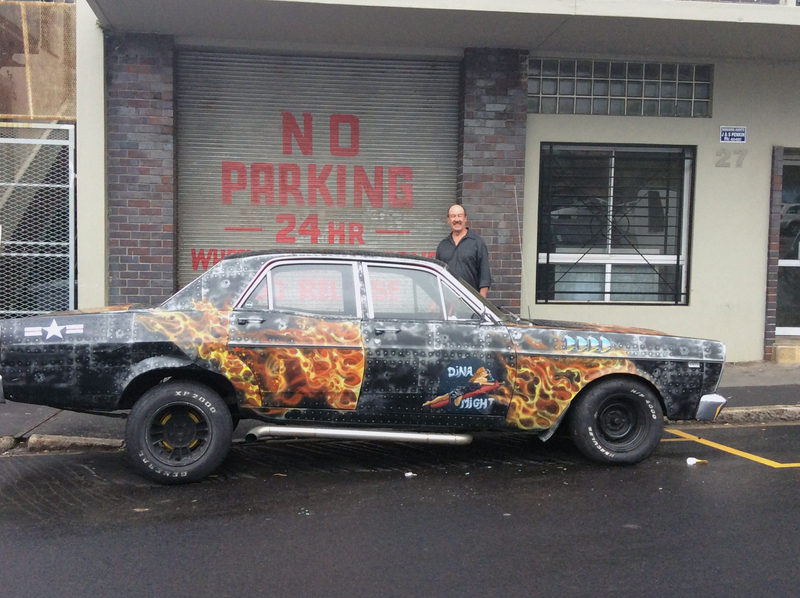 Reminded me of the flame-painted vehicle parked outside a ‘No parking’ sign we spotted with Dad last year.